legendary fire-breathing guitars. Later, he drifted into a “real” job, as an engineer for a major toy company. But the higher Robison rose in the company, the more he had to pretend to be “normal” and do what he simply couldn’t: communicate. It wasn’t worth the paycheck. It was not until he was forty that an insightful therapist told him he had the form of autism called Asperger’s syndrome. That understanding transformed the way Robison saw himself—and the world. 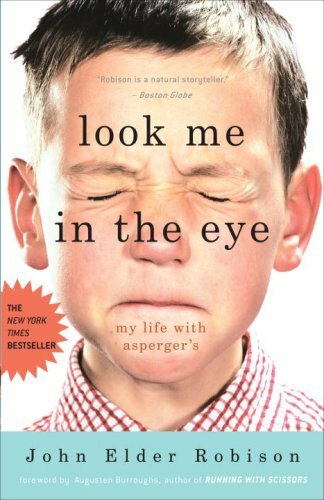 Look Me in the Eyeis the moving, darkly funny story of growing up with Asperger’s at a time when the diagnosis simply didn’t exist. A born storyteller, Robison takes you inside the head of a boy whom teachers and other adults regarded as “defective,” who could not avail himself of KISS’s endless supply of groupies, and who still has a peculiar aversion to using people’s given names (he calls his wife “Unit Two”). He also provides a fascinating reverse angle on the younger brother he left at the mercy of their nutty parents—the boy who would later change his name to Augusten Burroughs and write the bestselling memoirRunning with Scissors. Ultimately, this is the story of Robison’s journey from his world into ours, and his new life as a husband, father, and successful small business owner—repairing his beloved high-end automobiles. It’s a strange, sly, indelible account—sometimes alien, yet always deeply human. From the Hardcover edition. own car repair specialty shop---J E Robison Service. Eventually he was diagnosed by a therapist as having Aspergers. "Look Me in the Eye" is his honest and touching memoir.